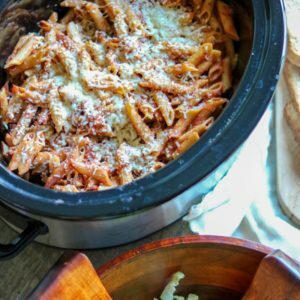 Slow Cooker Baked Ziti: The easiest, most comforting baked pasta dish you will ever have–all made in your slow-cooker. Perfect for busy days. If you have been following me for any amount of time, you know I love my Slow Cooker recipes. Hello, they are a busy parent or working person’s dream come true! How hard is it to work 10 hours and then spend hours making dinner? Or trying to help your kids with homework, while watching something on the stove? The slow cooker, crock-pot, whatever you call it, is the answer my friends. My most favorite comforting meal as a child, was my mom’s pasta and her homemade sauce. When I came home from school and smelled the tomatoes and oregano, I knew dinner would be good! I turned my Mom’s pasta into a one pot, easy, slow-cooker meal by making my homemade tomato sauce in the slow cooker, and then adding pasta and cheese at the end. YES, you heard me right! You can cook your pasta in the slow cooker! Your life is changed for the better now! This is beyond simple, only dirties up one dish, and is reminiscent of lasagna. Can you ever think of a time that lasagna only required one dish??? Yeah, no! Make your life easier and try out this Baked Pasta for the Slow Cooker. I love to start out by making a version of my homemade tomato sauce. But you can use any jarred spaghetti sauce your family likes, just be sure to add in an additional 1 cup water for pasta to have something to absorb while cooking. And you still need to let the sauce heat up before adding the pasta. I would cook on low for at least 1 hour. Adding browned meat or sliced italian sausages to the sauce adds great flavor and protein to this Easy Slow Cooker Pasta. I personally think that the cottage cheese adds the perfect creaminess and texture to this baked ziti, but you can use ricotta instead. You can mix the Mozarella cheese throughout the pasta or sprinkle on top, as I did. If you would like a browned cheese crust to your baked pasta, remove your insert from your slow cooker and place under broiler for 3-4 minutes, until cheese is browned and bubbly. If your slow cooker does not have an oven safe insert and you still want your cheese to get browned and bubbly, cook as directed, except leave Mozzarella cheese off dish. Once pasta is cooked, transfer to oven safe dish, sprinkle with cheese and broil for 3-5 minutes. Remember that the amount of time to cook your pasta depends on the type of pasta you use. Whole grain pasta needs 30-45 minutes and white pasta is about 15-20 minutes. Shape and size of pasta matters! 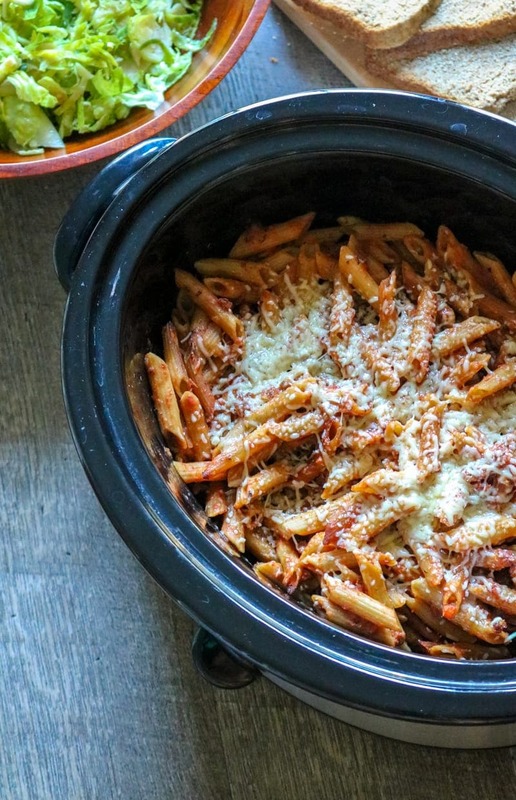 I have tried this Crock-Pot Ziti with ziti, rotini, and elbow noodles with success. I have never used spaghetti or rigatoni. If you are brave enough to try it out–let us know how it works out! I also have never tried to cook gluten-free pasta in the slow cooker. Easy Crock-Pot Pasta with a homemade tomato sauce. Mix together tomato puree, tomato paste, 2 cups water, oil, honey, and spices together in slow cooker. Set to low and cook for 4-5 hours. Turn slow cooker to high and mix in 1 cup water, pasta and cottage cheese. Top with cheese. Cover and let cook for about 45 minutes for whole grain pasta and 25 minutes for white pasta. love baked ziti! haven’t tried it in the slowcooker, good idea. I was so surprised it worked! And without even lifting a finger–the best kind of meals! Dear Kristen, I am heading to the store in an hour picking up the ingredients for this slow cooker meal. (For tonight!) Perfect for these busy soccer nights. Thank you! Yea!!! It is going to save you so much stress and feed your hungry crew after soccer! Totally hear you! We need to avoid those afternoon meltdowns at all costs! I’m happy to discover your blog through The SITS Girls Facebook Group. Awesome recipe! I’ll give this a try someday and let my family taste it. Perfect for snacks on a movie night! I hope your family loves it! This looks so delicious! And I love that it is for the slow cooker! Thanks for sharing on Creative K Kids’ Tasty Tuesdays link up. I have also pinned your recipe to our tasty Tuesday’s Pinterest Board. Hope to see you back next week! Slow Cooker meals are always the best! Can and how would you add meat? Stephanie, you can certainly add meat. You can brown up ground beef or sausage (1 pound) and add to remaining ingredients and cook as directed. You can also add raw sausage links and let cook with sauce–remove before serving and slice up and stir back into dish. Enjoy! My picky daughter will love this easy baked ziti! Can’t wait to try it!! Picky eaters DO love this! Baked Ziti is definitely a comfort food from my childhood! and now also a comfort food for my kids! My comfort food go to as well. What is the significance of the honey? Can it be left out? I typically don’t care for sweet red sauces. Hi Michelle, I am going to update right this recipe shortly to be sure it is super clear. You do NOT cook the ziti first. Part of the beauty of this fast meal 🙂 Enjoy! I made this recipe with rigatoni! I made a couple of modifications. I used 36 oz jar of my favorite pasta sauce and put crockpot on warm for 2.5 hours. Then added 1 lb browned ground beef, cottage cheese, and rigatoni. Note, you’ll need to add 12 oz (1.5 cups) of water for the rigatoni to cook in. Then took about 40 min on high to cook all the way through! I love when people are able to take inspiration from my recipe and make it their own. Sounds delicious Nadia! Wonderful recipe. Has become a family and friends favorite. I added a small amount of garlic powder to the sauce. I also cook in a couple shakes of Parmesan cheese — has passed the family test! Thank you for sharing.